Japan Meteorological Agency (JMA), is a department of the Ministry of Land, Infrastructure, Transport and Tourism in Japan. They use AWS based systems to store and share information collected from each of their 60 owned weather stations. Classmethod built the architecture that stores their massive amount of data for an extended period of time, by using Amazon S3, an access-controlled cloud storage. With Amazon S3, you could select data centers across the world from a singular unified user interface. You can also back up data without being concerned about data capacity limit. The limited access accounts allow local staff members to manage the access of their AWS services, and gives them the ability to update information effortlessly. With this new architecture, data from past disasters can be stored in the cloud for a long period of time. Additionally, in the event of a natural disaster, information is shared immediately between each local weather station and with JMA, thus allowing JMA to learn all the local information in great detail. This shared information between AWS systems and their weather stations helps to prevent or limits the potential of a secondary disaster. Such information also regularly helps local case studies in disaster management. The file storage services have optimal durability and availability. 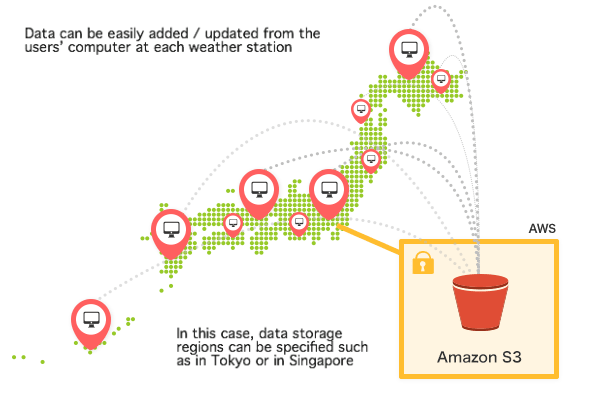 Data is optionally stored within 18 geographic Regions and 1 Local Region around the world (in Tokyo and Singapore regions in this case). Data in Amazon S3 is automatically backed up across a minimum of three physical Availability Zones. Data storage has minimal restrictions based on size and capacity. The administrator accounts enable you to manage the users’ accounts; to issue, terminate or delete them.